With great joy… we are having a little girl! Yet It is with deep sadness that I share the next part of our news. 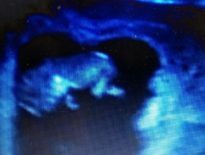 On Wednesday (March 27) during our 20 week ultrasound we discovered that our baby’s upper half of the brain has not developed, nor has the skull. It is a condition called anencephaly. The brain should normally develop in the first few weeks of pregnancy. The devastating news is that apart from God’s hand there is no cure, and because the brain has not developed, when the baby is born (if she does not die in the next 4 months in the womb) she will die within seconds, hours or potentially days after birth. Kevin and I are both in great sorrow and mourning over this news. Yet we are trusting in our great God and his goodness as we walk with him through this. Last night we both slept very little, my mind was filled with thoughts and sadness of what is to come, how I want to celebrate our sweet daughters life in the short time we have with her and how in the world God will walk us through the intense grief of knowing we will have her for such a short time and be planning our daughters funeral as we celebrate her arrival. I have many questions for the Lord, yet I am resting and clinging to His goodness (though I know times of anger are coming). We know that God will be greatly glorified through our daughters short life and want to step into grief and this season with the hope of heaven and how God will use our story to touch the lives of many around us and through us. You may wonder what we need right now. We are desperate for your prayers and if God would lay on your heart any words of encouragement or passages of scripture please send those thoughts… I know for myself, I need people to remind me of His truth b/c I know it will be so easy to dwell on the circumstances and not the One who holds and understands our circumstances more than I ever will. What can you be praying right now? Pray for our hearts to stay soft to the Lord, that we would cling to Him together and separately, and that God would strengthen our marriage and relationship with Him in this process. Pray for our heart as we watch others who are pregnant, that God would supernaturally free us from comparison or jealousy and give us the ability to celebrate with them in the midst of our own sadness. Pray that our baby would continue to survive and grow well (everything else looks great! ), that I would be able to have the strength and be able to have a natural birth (these types of babies often take longer to come and don’t have the necessary hormones in their bodies that help to stimulate labor and so there is a need to be induced). I want to be the most alert as possible with our baby b/c we may only have a few short moments together. Pray for supernatural healing & development of our baby’s brain and skull. Our hope is not in a miracle, but in our God, and with that we ask him to do what only he can do, if he so chooses. Pray that God would give us several days with our baby. That we would get to know her and that our families would get to meet her. Pray that we would trust the Lord one day at a time and prepare but not dwell on what’s to come, trusting that He will give us strength for each part of this journey. Pray that we would celebrate her life well, that God would lead us to a name for her soon, and lead us to sweet ways that will help us celebrate her for as long as we have her and the courage and strength to bury her and say hello and goodbye well. Pray that we would experience great joy and surprising moments of laughter in the midst of the deep heartache. Pray that God would give me strength and hope and joy in carrying her to full term in the midst of what I know is coming. Pray that we would grieve well together and in community. One thing that gives us such hope is knowing that our little daughter’s (who most likely will not be able to see when she is born, though we are hopeful) first sight will be Jesus, she will never know sin, and the only home she’ll ever know will be His and how sweet that she will be totally whole in Heaven and we will one day spend eternity with her…this season with out her will seem so long, but it is so short in the perspective of eternity. I laugh when I think of what her perspective will be when I see her again and she’s able to communicate “Oh sweet parents, I got the best end of the deal… I got to be with Jesus my whole life”. But I cannot comprehend that perspective through my tears, because right now I just wish that she would be ours for longer than a moment, and then I am reminded she was never ours to begin with. Kevin and I have given her to the Lord so many times in our prayers. She belongs to Him and the Lord truly is a gift giver in giving her to us, to care for in my womb and the short time we will have with her. We are so thankful for our family, friends and even strangers that are praying with us for our little girl. We wish that our story for our first baby, our first daughter would be different but as I’ve learned in waiting on the Lord for many things (especially Kevin 🙂 ).. His story for our lives is always better, always sweeter, always worth whatever suffering He asks us to go through. We hope and know we will see glimpses of that “better, sweeter, worth it” moments through this season, but we also know that He will use this in ways that we will never get to see this side of heaven.